Laptops, tablets and even cellphones have become a regular part of how schools in San Diego County teach students. Kids start the year checking out their school’s electronic device of choice, maybe an iPad or a laptop, and use it as part of their daily lessons. That was not always the case. Just 10 years ago, student technology meant a computer lab and maybe one or two desktop computers in each classroom. How school districts decide to pay for and manage those devices could have a profound impact for years to come, as technology becomes a central part of education. Connaghan said a 2016 survey of technology leaders at U.S. schools found most expect half their learning materials will be digital by 2019. Questions have been raised about the Sweetwater Union High School District’s student technology program. Begun in 2012, the district provides iPads to middle schools and has begun providing Lenovo laptops for some high school grade levels. inewsource reported that almost half of the about 30,600 iPads the district has purchased are no longer active. The most recent indication ofhow much the district has spent on student devices comes from a May 2015 school board agenda. It shows by that point the district had spent $14.3 million on 20,600 iPads. Sweetwater switched in 2015 to leasing new iPads. Two other districts in the county — San Diego Unified and Vista Unified — took different paths with introducing technology into their classrooms. San Diego Unified started buying mobile devices in the 2009-2010 school year with about 38,000 laptops for third- and sixth-graders and their teachers, and for high school math students and teachers. It has since bought 194,000 devices, including iPads, Android tablets, Chromebooks and Lenovo laptops for its more than 106,000 students. It has spent $133.2 million on the program. At Vista Unified, the district began the 2014-2015 school year with a Digital Promise grant from the Verizon Foundation. DeWayne Cossey, the district’s director of information technology, said Digital Promise had a map at that time of its League of Innovative schools. Only one from California was on it, and it was in Napa Valley. That grant provided more than 1,500 students and teachers with iPads. The district has also purchased some 1,000 iPads and about 380 Chromebooks for $478,000. Vista Unified, which spent two years building the internet infrastructure at its schools before it bought devices, soon realized it had to think about connectivity outside of the classroom. Students at the district, two-thirds of whom are on free or reduced lunch, did not always have access to Wi-Fi at home, making some of the take-home devices useless. So the district bought Wi-Fi hotspots students can check out from the school libraries. When school districts come to the San Diego County Office of Education’s Connaghan for help setting up a student technology program, she asks them questions about what they want to get out of the devices. She asks them to describe a school or classroom in two years. That means deciding what types of devices to use. At Vista Unified, that can depend on the individual school or even individual classroom. Some schools in the district have take-home iPads, and others have Chromebooks that stay on campus. San Diego Unified has used a range of devices, varying by school and grade level. It recently purchased almost 46,000 Chromebooks to replace Lenovo Netbooks and iPads it purchased in 2010 through 2012. Once districts have picked their electronic devices, they have to train their teachers how to incorporate the technology into the curriculum, Connaghan said. At San Diego Unified, a coach will meet with teachers and figure out what they want students to accomplish and how to best use technology to get there, said Julie Garcia, the district’s program manager for instructional technology. Vista Unified’s curriculum department conducts technology trainings for teachers during the year and during summer and spring breaks, Cossey said. Once the devices are being used, Connaghan said, districts need to measure how well they are meeting the goals they set for their technology program. Districts could set a metric of how learning has improved for a specific math concept in one grade, or it could be to improve digital literacy at an entire school. Manuel Rubio, a Sweetwater Union spokesman, told inewsource earlier this year that the district does not track whether the devices have an impact on students test scores or academic outcomes. “It is pretty anecdotal, but again we know that students need technology and will use technology in the future and so our hope is to prepare them for that,” he said. Garcia said San Diego Unified has done teacher surveys that show improvements in student behavior because of the devices, but that all of the measurements are anecdotal. Garcia was teaching middle school math when iPads were introduced. She used them by giving students video lectures, then splitting the kids up into groups based on their skill level in the class. She measured how students did on test scores before and after the technology. Almost all of the students saw a year’s worth of improvement. Five, she said, saw two years of improvement, including two special education students and an English-language learner. “When I saw those big jumps in test scores and to see it from those students who typically, you know, are hard to raise test scores for, I realized that technology was really making a difference for all my students, and specially those students that need those extra tools,” Garcia said. Almost every district, Connaghan said, finds different ways to pay for student technology. 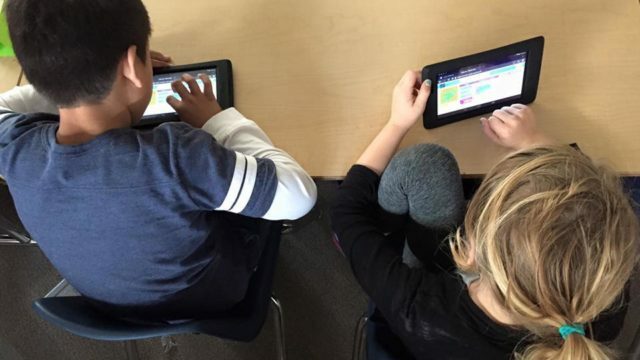 San Diego Unified now pays for the devices through short-term bonds. Originally the district used long-term bonds, which resulted in decades of interest payments for devices that will only last a few years. After criticism, the district switched its funding sources. Vista Unified uses Local Control and Accountability Plan funding, which are California education funds school districts have more control over. They require the districts to set and measure specific goals for the money, working with parents, teachers and staff throughout the district. Sweetwater Union originally used bond interest earnings and Mello-Roos special tax funds to help pay for the devices. After concerns from community members about the funding source, the district changed after the first year. Now it pays for student technology out of its general fund. The school districts also have different ways of getting rid of their electronic devices when they break or become outdated. Vista Unified, which began its program in 2014-2015, buys an extended three-year warranty for its devices. Broken devices are disposed of through the district’s electronic waste process, which recycles electronic equipment. San Diego Unified, which has had devices for eight years, tries to find new homes for aging devices within the district. For example, kindergartners and robotics classes have requested older iPads. The district has also donated about 26,000 devices to Computers 2 San Diego Kids, a nonprofit that refurbishes the devices and gives them to local families, Garcia said. Sweetwater announced in July it was selling about 10,300 of its outdated devices to Gazelle, a San Diego company that refurbishes and resells used electronics. The district expected to get about $800,000 for the devices, which will go back into its student technology initiative.